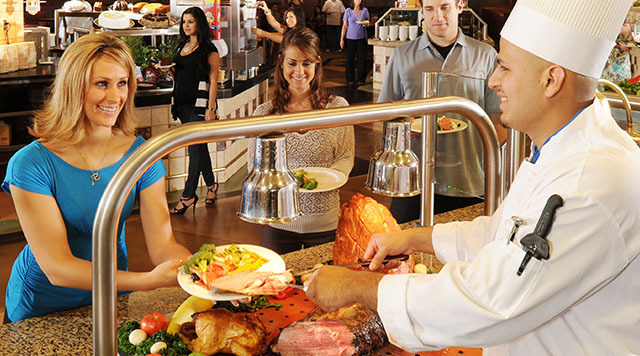 While there are a number of North Las Vegas buffets to choose from, the Cannery Row Buffet offers you a worldly experience without leaving the comfort of our hotel. At the Cannery Row Buffet, you can feel like a worldly traveler as you sample endless specialties from all over the world one delicious dish at a time. With something for every palate, guests of the Cannery Row Buffet can choose from a plentiful salad bar, Italian station, Asian section, American favorites, Chinese, Mexican and more. Guests can even satisfy their sweet tooth with a decadent dessert section that includes cakes, pies, ice cream, bread pudding and a bountiful sugar free section. Cannery Row Buffet is easy to get to and can’t be missed. From the Valet entrance, cross the casino and find Cannery Row Buffet adjacent to The Club. Bring your appetite and prepare to be wowed!